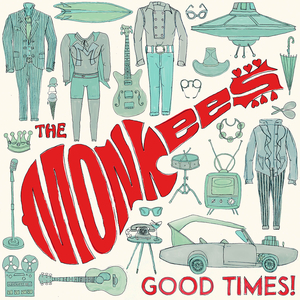 Listen to this track by golden anniversary-celebrating TV and pop music institution The Monkees. It’s “Me and Magdalena”, a cut from their latest album Good Times!. The record was released this past May, and features the work of several top shelf songwriters, some of whom helped the band to create their earliest hits (Goffin & King, Neil Diamond, Boyce & Hart, Harry Nilsson), and some who grew up with The Monkees and became songwriters themselves (Andy Partridge, Rivers Cuomo, Noel Gallagher, Paul Weller). Adam Schlesinger of Fountains Of Wayne produced the album and wrote or co-wrote a couple of tracks of his own. That’s quite a line-up! This particular tune was written by Death Cab For Cutie’s Ben Gibbard, known for the unique brand of sombre and melancholic Americana on his own records. Where does that fit in with the happy-go-lucky Monkees? Well, that would be the contributions of Michael Nesmith [note: could this song be a sequel to “What Am I Doing Hanging Round?“], who helped to fashion that same moody and rootsy sound from his work with the band to his solo career in the 1970s with the First National Band. Micky Dolenz and Nesmith harmonize on this track in a way that I don’t think I’ve ever heard them do. It is a wonderful surprise just how well they sing together. That’s the thing with The Monkees. Fifty years later, the band that many people thought weren’t even real had dimension and range to spare all along. That’s why this song works so well, and why it reminds us what this band has always been about since our childhoods. And therein lies the secret ingredient to this song, and to others on the album, too. The Monkees story has a distinctive mythical quality; the four TV boys who leaped out of the screen and became real. Because of that so many years later, they’re able to tap into something unique to them which age, absences, and even deaths haven’t been able to diminish. To overlapping generations of people, The Monkees TV show was a communal ritual. Not all of us were old enough to remember the first run from 1966-1968. But we all watched the re-runs, often all together after school at each other’s houses. This was first in the seventies, and then again in the eighties when MTV brought them back as if in tribute to the pioneers of the music video medium the band had always been. Because we loved the show so much, we loved the records too. These were mostly dog-eared copies of vinyl albums found in the racks of our parents’ record collections until the CD era when we made up for lost time and bought our own copies. In this respect, their fifty year anniversary as a media-hopping phenomenon from small screen, to recording studio, to stage, is as much a celebration of our own lives as it is one that celebrates theirs as a multi-media entity. “Before The Beatles, before The Velvet Underground and before punk and/or indie rock, The Monkees were the first band I truly loved. Their albums were always on in our home when I was a kid (especially Pisces, Aquarius, Capricorn & Jones Ltd.), and I learned to sing alongside them. I spent countless hours in front of the TV in the ’80s watching Monkees reruns wishing I could climb through the screen and be in the show with them. They made being in a band seem so fun — and goddammit, it should be! For these reasons and a million others, I can say with absolutely zero hyperbole that contributing “Me & Magdalena” to this album has been the greatest honor of my career.” (read the whole article on Stereogum.com). This is a common experience with this band; imagining how fun it must be to play music with each other as they did every week, or in my (and Ben’s!) case, in afternoon re-runs. In this way, they certainly passed it along, as is the mission of any band interested in building a legacy. In this case, those to whom they passed their influence along have been able to give back, too. “Me and Magdalena” sounds like a Monkees song in their Nesmithian quarter because the person who wrote it understood who they had always been, and injected his gratitude directly into it. The same can be said of Andy Partridge’s “You Bring The Summer”, which is in that Saturday morning psych vein for which The Monkees are also known, and Rivers Cuomo’s “She Makes Me Laugh” that touches on their power pop bubblegum side. This is more than just writing to type. It’s about these songwriters finally getting to do what we all wanted to do as children watching The Monkees; to finally get a chance to climb into the television and join the band for real to say thanks, and most likely given our timeline, to say goodbye, too. Besides the undiminished vocal performances from Dolenz and Nesmith on this track, it’s that child-like wonder, and that shimmering sense of gratitude that shines through the most. Micky Dolenz and Peter Tork (less Nesmith, who’s apparently busy writing a memoir) are touring the album as we speak. Find out more about the tour and where to buy the album at monkees.com. Great review and perfect thoughts about what I love about the Monkees! Gratitude is the feeling…. That’s certainly the way I look at it, and feel it. Thanks for comments and for reading! It contains all four bonus tracks that are available. Some versions at this-or-that retailer included one or two of them on CD or a bonus 7″, but you can still easily find this 10″ EP with all four. Anyway, it has an uptempo version of “Me and Magdalena.” Worth every penny of the purchase price for that alone. However, I’ve digitized them with studio quality equipment. Email me if you’d like them.